Join us on Sunday November 3rd 5pm-8pm for our 2nd Annual Apple Pie Bake-Off and Fundraiser! Don't worry, there's no Bears game that day, we already checked! 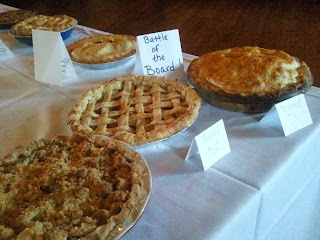 Some of you may remember the pie contest we had last year. It was so much fun we've decided to make it an annual event. This year the event will take place at the Junction Diner on Madison Street, a fun and family-friendly venue. Price of admission includes appetizers, sodas, tastes of pie, and one ticket to the Junction Diner's antique black and white photobooth per party. Beer and wine will be available at the Junction Diner's cash bar. If you are worried about your baking abilities, don't stress! This is an amateur contest and everyone is a winner! Its for fun and its to support the garden. Athena Uslander - Owner & Baker at Silverland Bakery (439 Des Plaines Ave., Forest Park). We'll also have a raffle, silent auction, and the mobile seed bank for your pleasure. If you've never been to the Junction Diner, its a really cool kid-friendly place. We hope you'll make it an evening with the family and come enjoy some pie with us!